My title might have you thinking--"Huh?" Really, I really did wash my snowflakes! How? Well, I used a technique featured on Stampin' Addicts in Rhonda's Technique Challenge--Emboss Rewash. This is a super-easy technique. 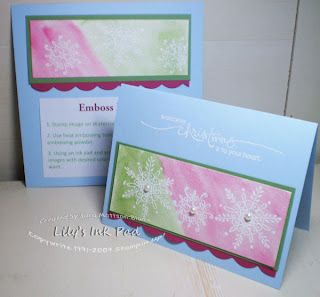 Simply use an aquapainter to paint over the embossing! Easy peasy and fun! I tried a nontraditional color scheme and I think I really like it! Plus, those pearls just add so much to the card! Sara, this is soooo beautiful....I love the soft pastel look for the snowflake background. What a cool technique -- perfect for the snowflakes! Way cool and beautiful and yes I was going huh lol this is awesome for snowflakes!! This technique really is perfect for the snowflakes! Great job!